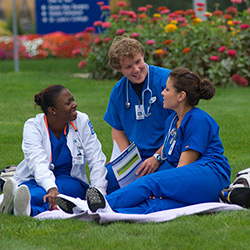 The best way to decide if St. Luke's College is the right fit for you is to visit our campus. Potential students and guests can schedule a personalized visit through the Office of Admissions. Visits can be scheduled around the academic year. In addition, we have Campus Visit Days scheduled each semester where interested students and their families can come to campus. These visit days provide an opportunity to learn about all of the academic programs at St. Luke's College and receive valuable admission and financial aid information. In addition, students can take part in some hands-on learning activities. Take EXIT 147B to Tyson Events Center/Downtown; turn left at the traffic light onto GORDON DRIVE; turn right, approx ½ block onto NEBRASKA ST; Continue on NEBRASKA ST and turn left on 26TH ST; turn right on PIERCE ST and again right at 2616 PIERCE St into our parking lot. Take EXIT 147B to Tyson Events Center/Downtown; Continue straight at the traffic light to NEBRASKA ST; Continue on NEBRASKA ST turn left on 26TH ST; turn right on PIERCE ST and again right at 2616 PIERCE St into our parking lot. At approximately the city limits HWY 20 becomes GORDON DRIVE; follow GORDON DRIVE approx 4 miles; turn right on NEBRASKA ST (directly after CHILI'S Restaurant on the right); Continue on NEBRASKA ST turn left on 26TH ST; turn right on PIERCE ST and again right at 2616 PIERCE St into our parking lot.